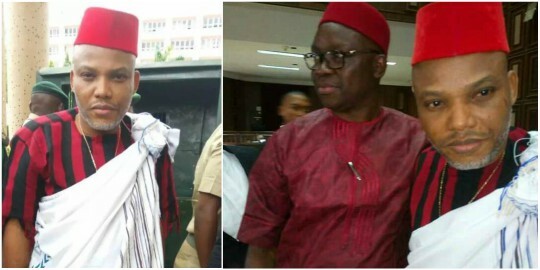 The Governor of Ekiti State, Ayodele Fayose, stormed Federal High Court 4, Abuja, in solidarity with IPOB Leader, Nnamdi K​anu,​ who was arraigned before Justice Nyako. Daily Post reports that Kanu, through his defence counsels led by Ifeanyi Ejiofor, asked the court to set aside the order made on December 13, 2016 for the protection of witnesses. jewish religious leader and highly respected person, and must own a land in anywhere in Abuja The bail bond is N100 million for each surety. He was also ordered never to grant any press interview pending the outcome of his trial He will not be in a gathering of more than 10 persons The judge on the matter Justice Binta Nyako said Kanu's bail will be revoked if any of the orders are flouted. However, the other accused persons were denied bail. According to the judge, treasonable felony - the charges against them is a serious offence against the state. Also, the judge refused the application by Kanu to vary her previous order on protecting witnesses in the matter. There was also a mild drama at the Abuja Division of the Federal High Court this morning, as security operatives, barred former Minister of Aviation, Mr. Femi Fani-Kayode, from entering inside the court scheduled to deliver ruling on whether the detained leader of the Indigenous People of Biafra, IPOB, Nnamdi Kanu, should be released on bail.